The most consistent member of the St. Louis Cardinals starting rotation in 2014 has been rewarded for his efforts, as the team signed him to a three-year, $22 million extension and avoid salary arbitration. As the Cardinals news release also notes, Lynn is the National League’s third-winningest pitcher since 2012. Here’s the rest of the news release. 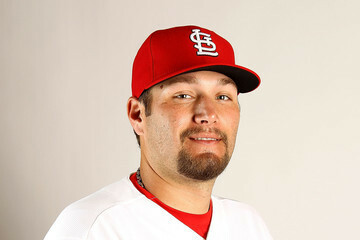 The St. Louis Cardinals announced today that they have reached agreement with right-handed pitcher Lance Lynn on a three-year contract (2015-17), thus avoiding salary arbitration. Financial terms were not disclosed. Drafted by the Cardinals in the first round (39th player overall) of the 2008 amateur draft, Lynn has compiled a 49-28 career won-loss mark with a 3.46 ERA in 119 games (97 games started). Since debuting in 2011, Lynn has been a member of a Cardinals team that has reached the postseason for a franchise-record four consecutive seasons with Lynn having appeared in a franchise-record 23 postseason games. Lynn’s 48 wins since 2012 are the third-highest amongst National League pitchers, trailing only teammate Adam Wainwright (53) and the Dodgers Clayton Kershaw (51). Lynn also ranks among N.L. leaders in games started (95-T7th) and innings pitched (581.1-11th) since 2012 and his 59 quality starts since 2012 rank 10th. This entry was posted in 2015 Cardinals and tagged Lance Lynn by Christine Coleman. Bookmark the permalink.